Continuation of my dinosaur-old backdated Taiwan entries! So, the rain slowed to a light drizzle as we arrived at the Martyrs' Shrine (located near The Grand Hotel) which was built to commemorate soldiers who sacrificed their lives fighting for the country. 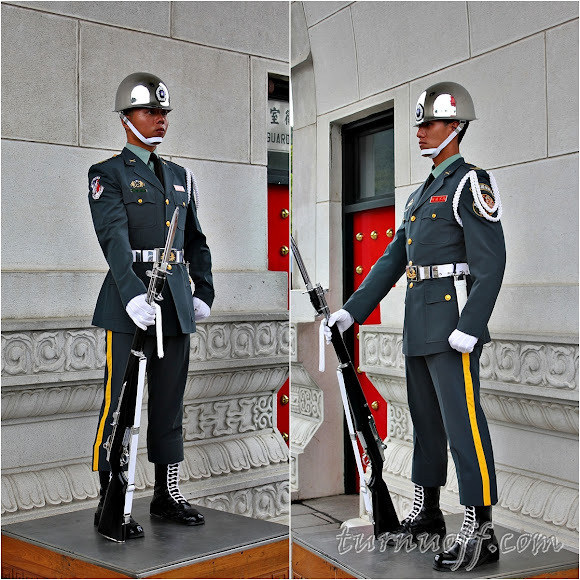 #1 Motionless military soldiers guard the entrance gate. #2 There were so many tourists from China congregating around and I actually had no idea what we were waiting to see. Just when we finished doing our toilet rounds, we could hear the synchronized clicking of soldiers' boots. #3 The clock ticked to the top of the hour and the guards made their way from the Martyrs' Shrine marched towards the gate, right towards me! Haha, I was lucky enough to have a good spot to see the guard mounting ceremony. #6 Tourists crowded around the area to wait for the action. #7 New guards came out from the guardroom readied to go on duty. #9 We stood only a few feet away watching the process of new guards (guards who is going on duty until the top of the next hour) exchanging duty with the old guards (guards who have been on duty). #11 A series of marching orders, rifle spinning, foot stomping, they did it all. Why do the handsome guards never smile on duty!? #13 After that, our tour guide took us here, which I thought it was a museum. "Wait... what?! Aren't we supposed to go to Taipei 101?" Since some of us were not interested in feng shui-related stuff, we escaped and stayed outside the store until the entire group had exited the store. Our tour guide who was smoking outside regaled us with the culture of betel nut as we noticed that people in Taiwan has habit to chew the world's fourth-most popular psychoactive substance after nicotine, alcohol and caffeine. #19 He said, "Try this. Chew, spit and don't swallow." #20 Nobody wanted to try, so I, the curious cat tried betel nut for the first time! O-M-G, IT TASTES INCREDIBLY BITTER and it's certainly not something I would enjoy! P/S: Just a reminder that all these pictures are from May 2012, gosh, wonder when I'll be done with these LOL!! !